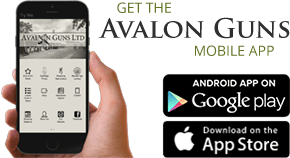 This web site is owned and operated by Avalon Guns Ltd who are completely dedicated to your total satisfaction. If you have any suggestions or comments or if you need to contact us, please email us using the link on the store page or use the details below. Orders are usually despatched within five working days (and often within two days) of placing the order. Small packages are sent royal mail first class recorded delivery and large items are shipped by courier. All deliveries will require a signature. Gun cabinets from two to five gun capacities, unless special delivery is arranged with a member of the mail order sales team, usually ship within ten working days. Larger cabinets ship in approximately 3 weeks. Books included in the best sellers’ category are usually despatched within 5 working days; those, which are not, usually ship within ten. Uk orders are normally received in 14 business days. International orders are generally received in less than 28 days. Credit/Debit Card Information - This is a service offered by Worldpay – you have the option of storing your card details for future use, details are stored encrypted and tokenised by Worldpay – Your card details cannot be deciphered once encrypted. We use the information you provide about yourself when placing an order only to complete that order. We do not share this information with outside parties except to the extent necessary to complete that order. – For example Royal Mail, Parcelforce. We use the information you provide about someone else when placing an order only to ship the product and to confirm delivery. We do not share this information with outside parties except to the extent necessary to complete that order. – For example Royal Mail, Parcelforce. Information we collect for finance applications is used only for the purpose of Credit Checks through Callcredit Limited. Please include a brief note including the full name and address of the person who placed the order so that we can find them on our database. Please note that (unless the return is due to a fault or error) we do not refund postage costs and postage will also be charged on any goods we send out in exchange. Refunds - Refunds by Paypal may take 3-4 working days - Refunds to cards vary depending on the Schedule of the banks. We advise customers that we process refunds instantly but the time that it may take can be upto 14 days - Usually we see payments return in 3-4 working days or around 7 days during busy periods.